Natural Gas Vehicles (NGVs) are available to the consumer today in the form of cars, light trucks, and SUVs. Whether it’s for personal use or for business, CNG vehicles offer economic and environmental benefits, while retaining the same engine power and miles per gallon produced by gasoline. From shuttling the kids around town to pulling a trailer with a pickup, NGVs provide the same performance benefits as gasoline or diesel powered vehicles, with improved fuel economy and less of an environmental impact. In fact, the U.S. EPA has called the natural gas powered Honda Civic GX the cleanest internal-combustion vehicle on the planet. View an up-to-date list of car and light truck NGVs worldwide or a list of NGVsavailable in the U.S.
Purchase a new vehicle: Automotive manufactures like Ford, GM, Honda and others have new natural gas vehicles available for purchase. In Idaho, NGVs are available for purchase at dealerships. Retrofit existing vehicles: Diesel or gasoline powered vehicles can also be converted to CNG through a certified installer. Vehicle auctions: Government agencies, many of which have made substantial investments in CNG vehicles, often sell excess vehicles or those that have reached a certain age or mileage level. Though such purchases may not qualify for a tax credit, vehicles are often sold at fair market value, often at very affordable prices. 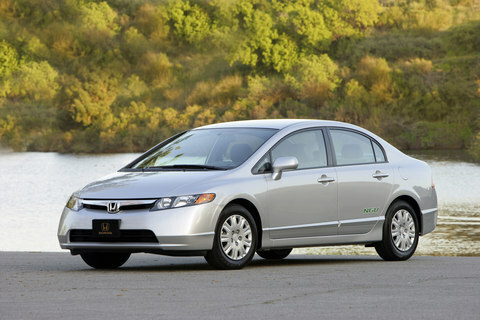 The CNG powered Honda Civic GX: “The cleanest internal-combustion vehicle in the U.S.